I strongly believe that everyone should try and visit Vietnam at some point in their lifetime. It’s a truly fascinating country, one filled so many incredible things to see and do, as well as endless new places to discover. And just as important, are the people of Vietnam, who helped to make our stay so unforgettable. I found them to be amongst the nicest people I have met anywhere, and truly resilient in helping to rebuild their country after the devastating effects they experienced through the war with America. So, do I believe that Vietnam is worth visiting? Hell yes! And here is my ultimate list of the 50 best things to do in Vietnam, which cover most of the countries most popular locations. As you’ve probably already guessed, one of the best things to do in Vietnam is to learn more about the war they had with America, which ended in 1973. If you aren't aware of anything that happened during the conflict, then the first thing you should learn is that the country was completely devastated as a result. Both sides were responsible for horrible crimes, and the effects of napalm bombing left vast swathes of the country burnt to a crisp. 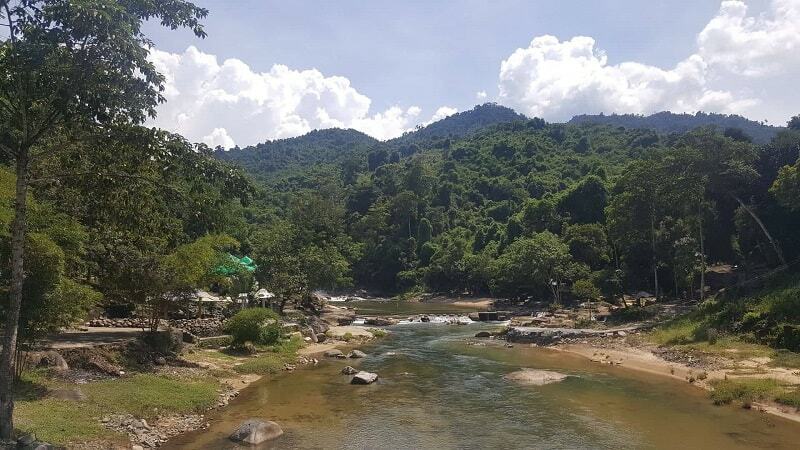 But don’t worry, Vietnam is still beautiful, and you can hardly tell that a war took place when driving through seemingly endless green forests on your way up the country. However, there is one place in particular that the effects of war can still very much be seen, and that is the War Remnants Museum in Ho Chi Minh city. Here, you’ll discover leftover memorabilia from the war, including tanks and other army vehicles parked right outside the entrance. Inside, there are rooms filled with stories and images of those affected by the war. All in all, it tells a chilling story of events. You’ll quickly find that the museum is very biased in the favour of the Vietnamese (which is understandable), but it is still so shocking to discover how far each side went in their desire to beat the other. Ho Chi Minh plays host to another great location to learn more about the war, and these are the Cu Chi tunnels that lie about an hour outside of the city. Once again, you will likely find that they come across almost propaganda-like in how they paint the horrors committed by the Americans, and forgo their own role in the war. But at the same time, it is certainly one of the best places in Vietnam to gain insight into what life was like for the Viet Cong. They form part of a vast underground network that existed all under the country, in order to help hide the guerilla fighters. You don't have to go into the tunnels, but you can if you like. Just be warned, they are incredibly narrow and tight, meaning that if you suffer from claustrophobia, then they certainly aren't for you! 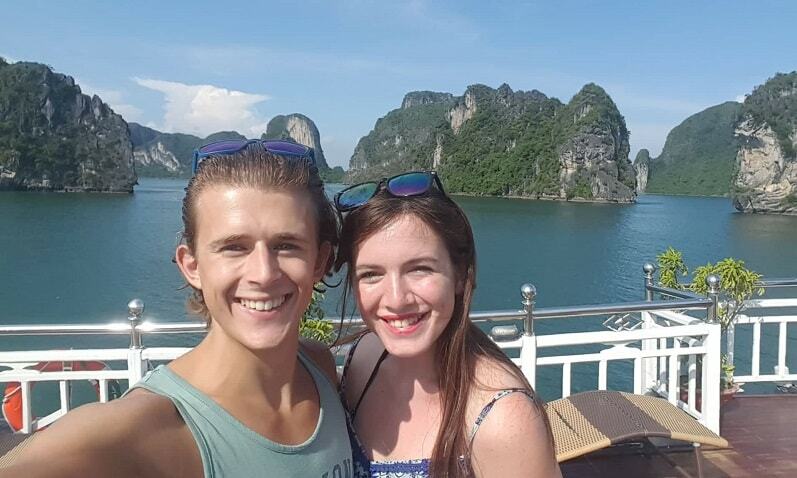 Another great thing about Vietnam, if you’re young backpackers like us, is that there are plenty of chances to meet fellow travellers and let loose in the evenings. Alcohol is relatively affordable all across the country and there a few spots that are particularly good for showing live music. Ho Chi Minh is one such place, but more specifically, Bui Vien. It’s hard to miss it if you're staying in the heart of Ho Chi Minh, as it’s a long strip filled with indoor and outdoor bars. So though drinking here is one of the best things to do in Vietnam, do be warned that it’s not a great place to stay! The music continues late into the night, so you’ll certainly need earplugs if you hope to get any sort of sleep! 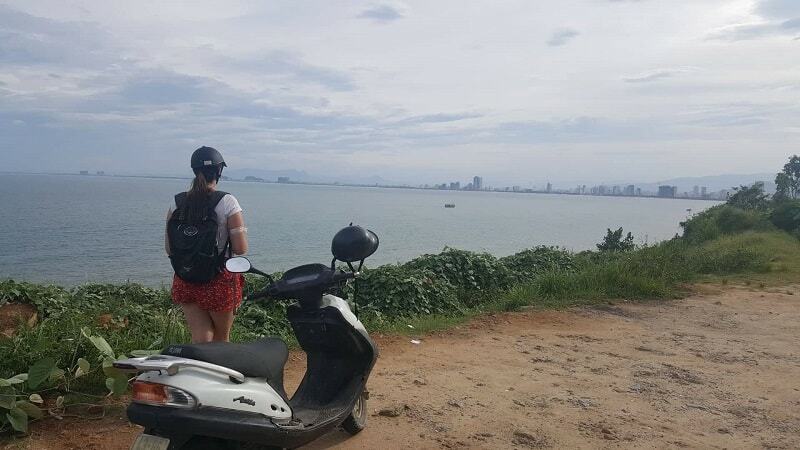 Without a doubt, the number one thing to do in Vietnam is to hire a moped and drive yourself around the sites. We did this in every stop on our 3 week journey through the country and it was the most fun thing I think I've done in South East Asia. The feeling of having a moped and driving yourself around through the spectacular Vietnamese countryside is out of this world. My favourite time of the day being in the last hour or so before sunset when the weather begins to cool and the whole country seems to wind down. You can spot locals out finishing up in the fields, and it’s just a great way to end a busy day spent exploring in the heat. And don’t worry, learning to ride a moped is incredibly easy. 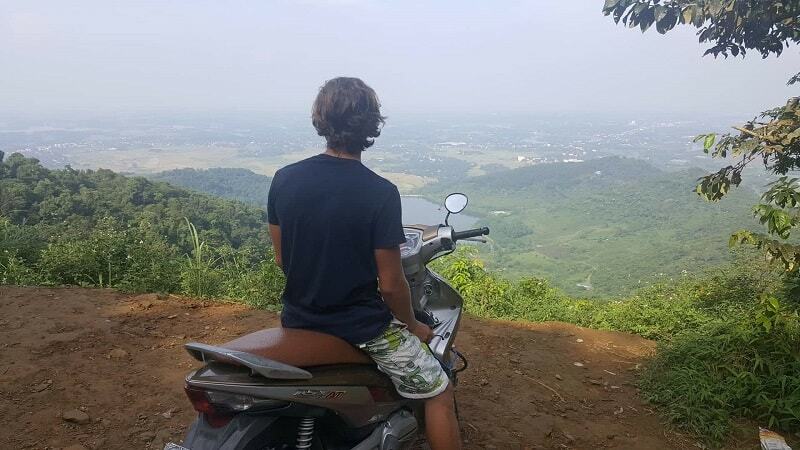 I first learnt and then used it as our go-to way of getting around Bali; after that, I never looked back! But when you do hire one, I recommend using this checklist here to make sure you get one that is safe and fit for use. If you’re wondering what to do in Vietnam and are keen to brush up on your watersports skills or learn a new sport, then you’ve plenty of opportunity. Many of the most popular coastal cities, such as Mui Ne and Nha Trang, offer the chance to do a number of different sports. This includes things like kite surfing, jet skiing and flyboarding. Surfing isn't a particularly popular sport in the country, however, some beaches do offer chances to catch a wave or two at certain times of the year. This includes Mui Ne, Vung Tau and China Beach. Whilst we’re on the topic of Mui Ne, it’s definitely worth mentioning the sand dunes they have here. The red sand dunes are incredibly unique and are something you probably didn't expect to find in Vietnam. In fact, when you're out exploring them, you almost feel like a world away from the tropical rainforests and rolling fields of green found further inland. 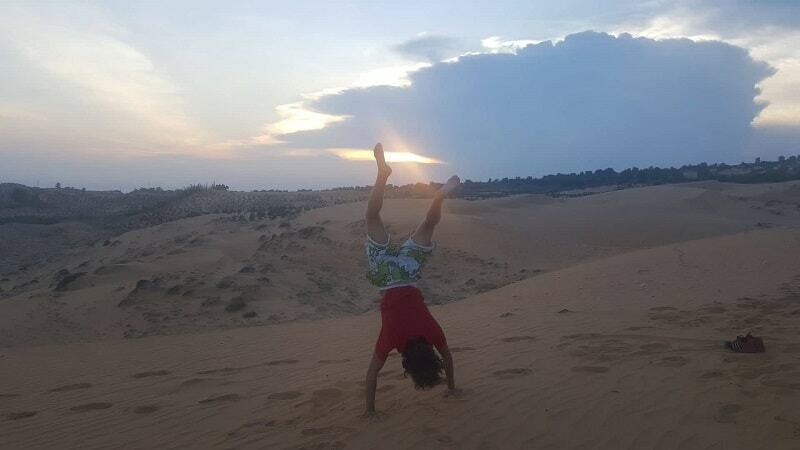 Well, once sunset rolls around, there are few better spots in the country than the red sand dunes in Mui Ne. They offer wonderful sunsets and, in the hour before the sun goes down, the street alongside the spot quickly fills up with mopeds and guided tour buses, so be sure to get there ahead of time. One of the more adventurous things to do in Vietnam is to hire a sand buggy when out on the other sand dunes in Mui Ne. 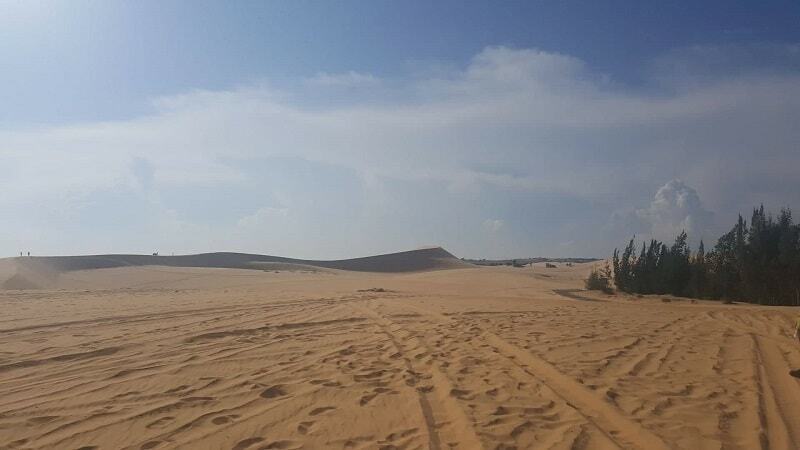 These ones aren’t red, but do stretch out far farther, offering the chance to have a lot of fun either out on a dune buggy, or surfing down the dunes. The latter of which we tried a number of times, but failed miserably! It was fun, though incredibly hot and I ended up going home with underwear filled with sand! So, thought the dune buggies are quite a bit pricier, they are a lot more fun! 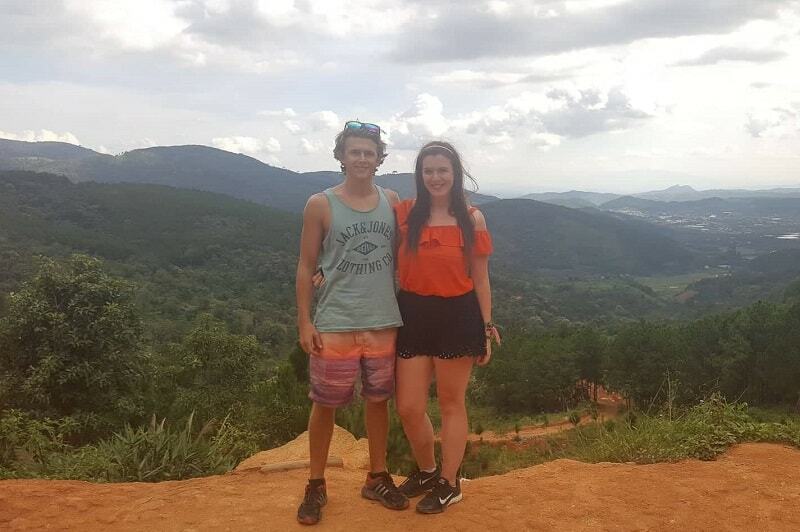 If you're wondering what there is to see in Vietnam for couples, then the Valley of Love in Da Lat is a good spot to head to. It is actually quite a famous thing to do and seems to attract hundreds of tourists every day. This also means that it has become very overpriced in recent years which puts a lot of people off! Still, if you can head there just before sunset, then it's a lovely place to stroll around in the final cool hour or so prior to the sun going down. Da Lat is home to another one of the more romantic things to do in Vietnam, which is the large lake they have right in the centre of town. Xuan Huong Lake is actually surprisingly big and is a wonderful spot to visit when in Vietnam. It was created in the early 21th century by damming a river that flowed through the region. Nowadays, it is used for all kinds of different purposes, one being swan rides. It might sound corny but it's actually a lot of fun, and you can pick up a swan from a few different vendors located around the lake. We also tried dining at a fancy-looking restaurant that sits right on the lake called Bluewater Restaurant. But it turned out the be very bad food and was about 3 or 4 times the price of anywhere else in Da lat; so I’d recommend giving that a miss and instead riding a swan or taking a nice walk around the lake. Visiting waterfalls is on my list of top 10 things to do in Vietnam, seeing as there are so many gorgeous falls located across the country. Da Lat in particular seemed to be a great spot to see waterfalls, and there are two that best stick in my mind. These were Datanla Falls and Elephant Falls. Datanla Falls are a part of a larger complex filled with tourists and other activities to do. Elephant Falls were a little more rugged, as there's a broken path you can take which allows you to get right up close to the falls. Yes, this can be a little slippery, but it’s worth the walk down and you get nicely cooled down from the heat of the midday sun. In the same park as Datanla Falls, you’ll find a long winding tobogganing ride. It turned out to be a lot of fun and is very practical as well as it saves you a lot of walking through the park. You also have full control over how fast you go, sue to a brake lever on the side of the cart. It's pretty cheap to do and well worth a go, just be sure to strap your belongings down when on there as I lost my glasses whilst riding it! One of the more unusual things we discovered you can do in Vietnam is to go abseiling down a waterfall! This is also in Da Lat, in the same park as you will find Datanla Falls and the toboggan. It is quite a bit more expensive than most other places to visit in Vietnam, but is quite a unique experience that I would like to do when we next return to the area. As a part of the tour package, you can also carry out some other adventure activities such as having a go on the treetop assault course they have built there. If you’re interested in finding out more about these tours, then here's a useful link on TripAdvisor. The Vinpearl Amusement Park in Nha Trang is perhaps one of the more touristy places to visit in Vietnam. They don't have a lot of theme parks in the country, but based on reviews online this one seems to be by far the best! Sure, the rides themselves don't match up to the sorts of epic roller coasters found in the UK and in America, but it is still a lot of fun! In particular, I recommend visiting so you can enjoy the waterpark they have there. It’s probably the best part of the park and they even have a floating assault course in the water. 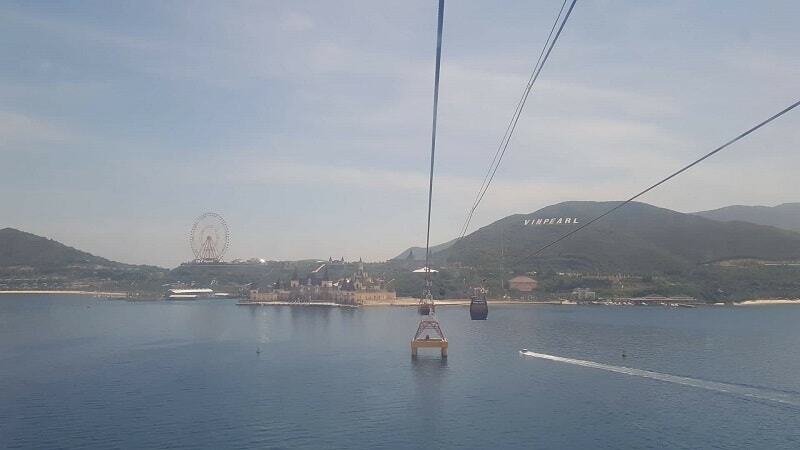 One of the best parts of visiting Vinpearl is taking the cable car to and from the mainland, as it’s located on an island just offshore from Nha Trang. You can see the park quite clearly from the beach in Nha Trang and at night, it’s wonderful seeing it lit up against the darkness. You can also stay on the island at the luxury Vinpearl Resort, however, it is relatively expensive to do so! I’ve never been on any sort of spa day/mud bath experience before, so this ended up being one of my favorite and fun things to do in Vietnam. We chose to go to Tháp Bà Spa which is located not far from Nha Trang city centre. It is a part of a modern spa facility and they offer plenty of other treatments if you're interested. The one we went for included a mud bath and then gave you unlimited access to the water baths and large hot and cold swimming pools. It ended up being a lot of fun and sitting in the mud baths themselves was quite a strange feeling. Also, I’m really not sure what sort of benefit they do give, as my skin didn't feel much different afterwards; but it’s well worth it nonetheless! Yang Bay Falls Park is, in my opinion, one of the most underrated Vietnam attractions. We only discovered it by chance when surfing through tonnes of articles online for the best things to do in Nha Trang. Very few people seem to go there and none of our friends who have visited Nha Trang seemed to have been there either. Either way, make sure you go! The drive out there by moped is on its own so much fun, especially the drive back through the fields as the day was starting to cool down and you could wave to workers out in the fields. When there, you’ll discover a bunch of things to do, including bathing in natural hot springs, swimming in a river with a waterfall, using the Tarzan rope swing into the water, visiting a miniature zoo and dining at a nice restaurant they have there. There’s also a small alligator complex on the site, as well as a miniature train that takes you around the different sites. I must admit, it seems most people visit as a part of an organised tour, and very few people there seemed to speak English. But regardless, I highly recommend it. Hoi An Ancient town is easily one of Vietnam’s most popular tourist spots. It’s a quaint, old style area filled with charming stone houses and shops selling everything through from tasty Vietnamese food to souvenirs and gifts for friends back home. To find out more, I recommend reading this post I wrote about Hoi An Ancient Town. You can choose to slowly wander the streets, or instead hire a bike and ride around there and head further up along the canal which runs through the old town. Also, if you're wondering where to go in Vietnam to pick up a cheap suit or other clothes, then this is a good place to start! On certain nights each month, Hoi An Ancient town quickly turns into one of the best things to see in Vietnam. The streets are suddenly adorned with hundreds and thousands of lanterns, all made from different colours and creating a wonderfully colourful glow against the backdrop of night. To best enjoy the lanterns in Hoi An, I recommend finding yourself a nice open-roof restaurant near to the canal. Here, you can grab some food and a drink and watch the whole area come to life with tourists and traders. I’m pretty sure you’ll see a decent amount of lanterns most evenings in Hoi An, but for the actual festival nights when the area is packed full of them, you can check the dates here. The Hai Van Pass is famous as being one of the most scenic routes in Vietnam. It is a 21km stretch that lies on the journey from Hue to Danang. The best way to enjoy the Hoi Van Pass is through the Easy Rider tours that take place every day. Easy Rider operates motorbike journeys across many parts of Vietnam, but are particularly popular for this stretch. A few times, we had riders trying to sell us a tour when passing us as we were walking down the street and it involves you riding on the back of their motorbike. Alternatively, you can book a day trip by car if you’d prefer, like this one here. One of the newest must-see places in Vietnam is the Golden Bridge in Da Nang. 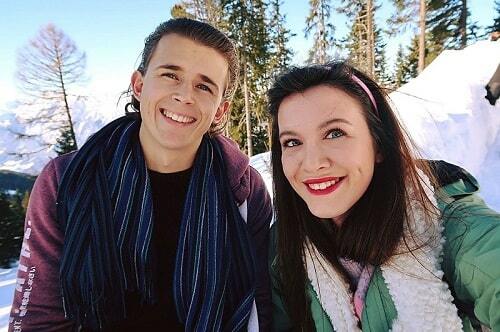 It was only opened in June 2018, so, unfortunately, we have not yet been fortunate enough to see it. But from the pictures, it really does seem incredible! 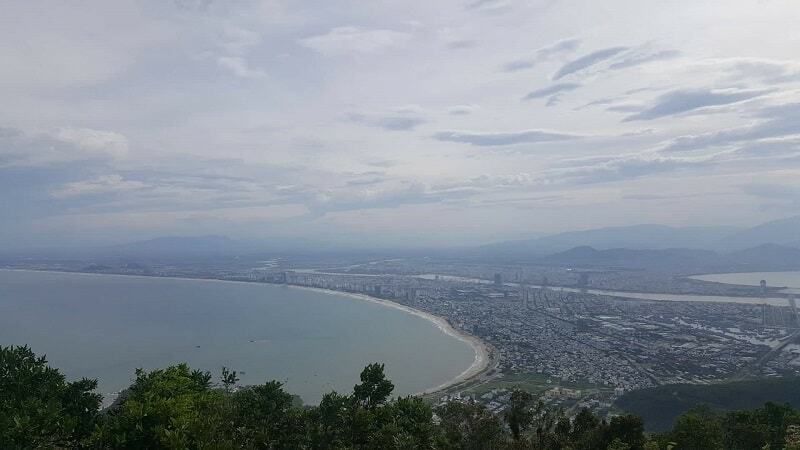 It’s a passenger foot bridge that stretches for 150 metres, offering views right down over Danang. It’s very high up, so on many days it looks as if you are above even the clouds! More impressive is it’s unique design, which entails two large stone hands supporting the bridge. When we next return to Vietnam, I can't wait to go here. Vietnam has one of the richest and most interesting histories of any country in Asia, and you can learn more about its ancient past in Hue. This city was once the ruling capital of the country and was home to Vietnamese emperors since before the 1800s. In the early 19th century, the Imperial City was built and then became the imperial seat of the country. Today, you can roam endlessly around the large city and discover what life was like for the emperors who once ruled from here. The gardens are still well maintained and the compound contains buildings and artifacts dating back hundreds of years. There is also a museum located just next to the city, which contains many of the most treasured items in Hue. When you research things to do in Hue, you’ll soon discover that there are a stupidly large number of tombs surrounding the historic capital of Vietnam. These contain the bodies of the once-emperors of Vietnam who ruled the country for a few hundred years. Many of the tombs are a part of their own personal luxury retreats located outside of the busy city. A few of them contain lakes and temples, as well as walled grounds that have all been perfectly manicured and looked after ever since. They are really nice to visit, but it's not worth going to them all as it soon becomes incredibly tiring and tedious in the hot midday sun. The abandoned waterpark, just outside Hue is one of the more unusual and unexpected things to do in Vietnam. The waterpark, called Ho Thuy Tien Lake, was built in the early 2000s and was only open for a few weeks in 2004 before being suddenly shut down. It has never reopened and has since become an eerie and fascinating place to explore for more adventurous backpackers. It seems like a real shame that it’s no longer open as they clearly spent millions of dollars developing it and I imagine it would be really popular these days amongst backpackers! Either way, it's still worth a visit and you can pick up some really cool photos whilst there. Read Also: 19 Incredible Things To Do In Hue: The Imperial City + More! 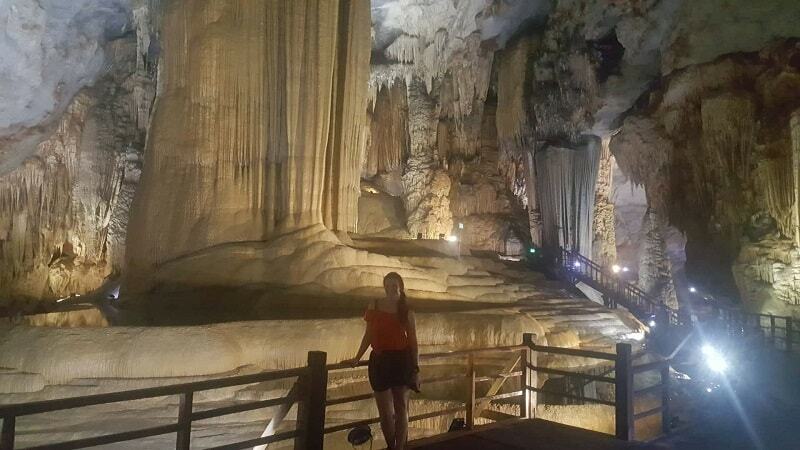 By far one of the best Vietnam travel spots is the extraordinary cave located in Phong NHA, known as Paradise Cave. The drive out to it is once again incredible, as you pass through some of the nicest countryside we discovered anywhere in Vietnam. The whole region in Phong Nha is very underdeveloped and rural, making it such a nice place to discover. Either way, once you reach Paradise Cave, you are then amazed by the sheer size and beauty of this large underground cavern. The entrance fee is relatively low and there is a clearly marked path that leads you deep into the cave. 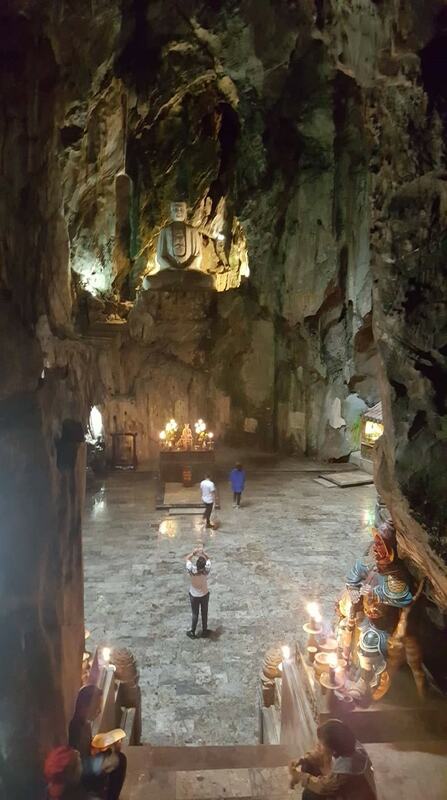 The other popular cave in Phong NHA that is open to tourists is known simply as Phong NHA caves. This one is closer to the main strip of hotels in Phong NHA and is only accessible via boat. Because you need to book onto a tour boat to take you there, this cave is a bit pricier than the other but equally as impressive in its own right. 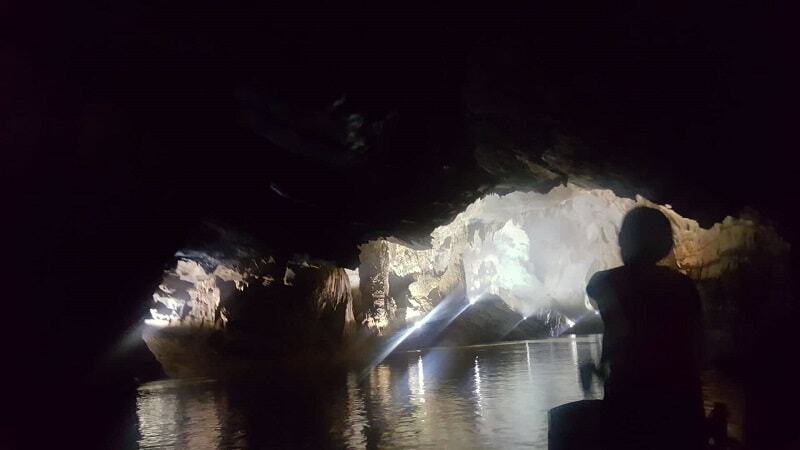 They take you on an enjoyable 45 minute ride downstream where you can talk to the guide and get to learn more about the caves and the history of the region. It turns out our guy had his house destroyed by the storm that passed by just a couple days before, but he was surprisingly fine about the whole thing! Once you arrive at the cave, they then take you further inside. I think how far you go depends on the time of year and how high the water level is. Either way, before leaving you get chance to step out onto dry land and walk around part of the cave before reboarding your boat and sailing back up to town. One of the most photographed areas in Hanoi is Train Street. The train comes by twice a day and literally runs right past peoples windows on either side of the tracks. It’s crazy to think that a train operates like this in the middle of somewhere so crowded and as busy as Hanoi Old Quarter. But, well it does and it makes for a wonderful place to get some quirky photos! Watch out for vibrations on the track, so you know when to get out of the way before it arrives; as the train does not slow down as it goes by. For more information on how to find it and make the most of your stay, here is a useful guide. That’s right, Ho Chi Minh is a real person! The city used to be called Saigon, up until 1976 when it was renamed after their revolutionary leader. Ho Chi Minh was a fascinated individual and it would take to long here to dig into the role he played in running Vietnam and helping to form the Viet Cong. Still, one of the top things to do in Hanoi is to go and see the mausoleum in which he is buried. As a word of warning, do not try to take any photos here. The room is closely guarded at all hours by a number of guards and you might even be thrown in jail for trying to capture a shot of the man. Though there are a few things to see in Hanoi, the most enjoyable part of our stay here was hiring a moped and heading out for the day to Ba Vi National Park. It is roughly an hour and a half drive outside of the city and, once you arrive, you can then spend about another half hour to an hour driving up the mountain that lies inside of the park. As you get higher, the views get more and more spectacular and it really does feel like an entirely different world away from the hustle and bustle of Hanoi. Halfway up, you come across an old abandoned church, as well as outhouses and homes that were once occupied as holiday homes for rich Vietnamese folk. There are some newer buildings there as well, and we saw one couple having wedding photos taken at different spots up the mountain. Once again, this seems to be one of the lesser-known things to do in Vietnam, but if you are wondering what to do in Vietnam and want to escape the busy cities and instead see some rural paradise, then I really recommend this. 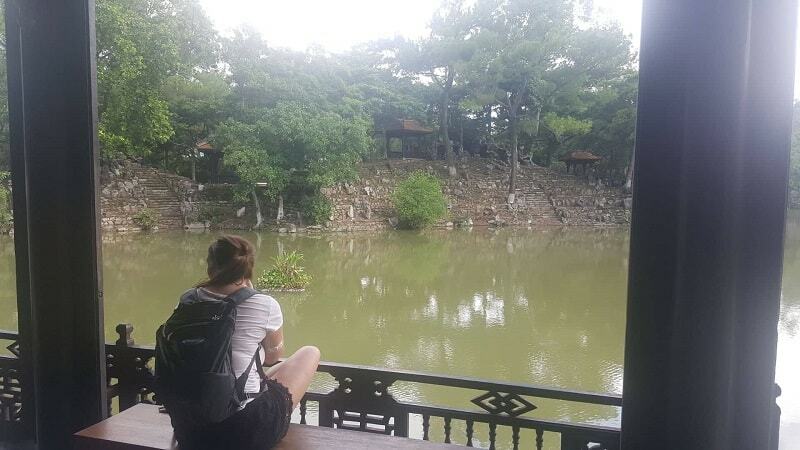 Another thing you must do during your time in Hanoi, is to visit the Hoan Kiem Lake. This is a large, freshwater lake that sits right in the heart of Hanoi’s historical centre. We found it to be a wonderful break from the noise and clamour of the city around it, and is particularly popular on evenings and weekends, especially for families. When we were there on one Saturday night, they seemed to have a giant market going on, with stalls and vendors located all around the lake, and even further into the streets as well. It was the perfect place to stroll around with friends we had met and to pick up a bunch of gifts and souvenirs. For me, the best part was at the southern end of the lake, where they had a group of people hiring out small buggy cart contraptions that you ride around. Though they're probably aimed mostly at kids, they were so much fun and we all had a go. It turns out that this is a famous Hanoi Night Market that is held almost every Friday, Saturday and Sunday night. Halong Bay is a UNESCO World Heritage Site and by far one of the best places to visit in Vietnam. Every year it draws in hundreds of thousands of tourists, right through from budget backpackers to couples on a honeymoon getaway. There are more than a hundred different tour operators offering cruises within Halong Bay. These range from cheap 1 day tours of the bay to 3 or 4 night cruises on luxury 5 star yachts. There really is a cruise to suit all kinds of traveller and, though it has become a little crowded in recent years, it is still something you simply have to do whilst in Vietnam. We opted for a cruise run by Rosa Cruise which ended being a perfect choice for us. It was a 2 day, 1 night tour which was middle of the range in terms of price, but certainly above average in what was offered. We would highly recommend Rosa Cruise to other travellers and you can read more about our experience in this post here. One of the great things to do in Halong Bay is to check out a pearl farm that exists solely out on the water. For us, this was a part of our organised tour and it was very interesting getting to learn more about how pearls are grown and turned into high-quality jewellery. Whilst on a tour of the pearl farm, you also get the chance to pick yourself up some handcrafted jewelry that has been made right there. My knowledge of pearls is absolutely useless, but they did seem quite reasonably priced, especially seeing as you get to witness the pearls being grown right before your eyes. Picking up a pearl necklace will certainly prove to be one of the more expensive things to do whilst in Vietnam, but there will be a great story behind the piece you decide to buy. It’s possible to go sea kayaking in a few different spots throughout Vietnam, but we had the chance to do this on Halong Bay. Again, this was a part of the tour, but it’s an awesome experience being able to kayak amidst such a famous and truly breathtaking landscape. Plenty of tour operators include sea kayaking as a part of their tours and it’s great fun if you’re there with a big group of friends. When out exploring Halong Bay, you’ll discover another one of the most popular Vietnam tourist spots … Cat Ba Island. This is the largest of a collection of more than 360 islands located in Halong Bay and is a popular place to stop for a night or two whilst out on a Halong Bay tour. It is a popular place for relaxing, as there are tonnes of sandy beaches here as well as modern restaurants and hotels. But don’t worry, it’s affordable for backpackers as well, and you’ll find a load of affordable hotels and hostels on Booking.com. You can charter a route out to Cat Ba Island if you just want to stay there and not cruise the bay. Alternatively, book onto a cruise that drops you off there halfway through your tour and then picks you backup a day or two later. By far one of the best parts of any Vietnam trip is the ability to eat out whenever you want! As we travel on a budget in most places, we are always conscious of overspending on food. And in places like South America, we had to try and cook our own meals wherever possible. But in Vietnam, everything is so cheap that you can eat out for just a few dollars every single night! Local Vietnamese restaurants are actually very nice and it’s a great way to discover true homemade Vietnamese dishes, most commonly Pho (a type of noodle soup). But there are plenty of westernised restaurants as well, all still very cheap. 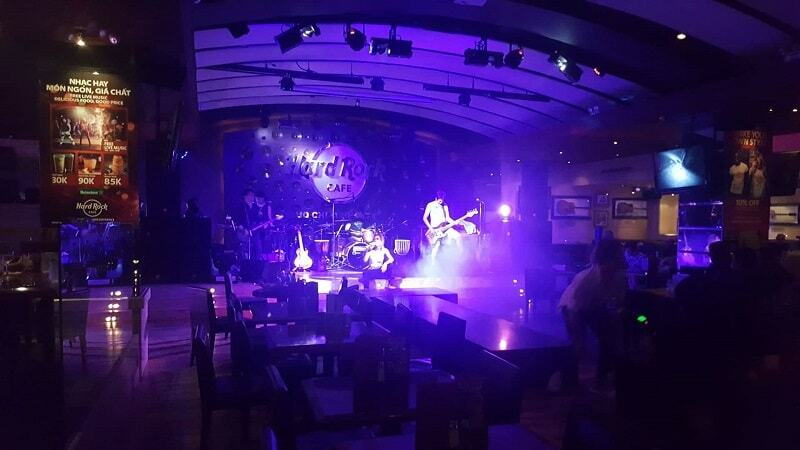 Our favourite being Hard Rock Cafe in Ho Chi Minh City which ended up being cheaper than Hard Rock Cafe’s elsewhere in the world and they also had a Queen tribute band that night! One of the best ways to explore Vietnam is to buy yourself a hop-on, hop-off bus ticket in one of the major cities. These are very cheap and for around 30 dollars you can visit all of the major towns and cities across Vietnam. What’s also nice is that they are very comfortable buses, by far the best buses you’ll find anywhere in Southeast Asia! We have taken a lot of buses now through Asia, but it was such a pleasant surprise that for all long journeys, you are able to actually relax and sleep in their sleeper buses. This might not excite you as much, but the novelty and comfort meant that, for me, they more than deserve a place on this list! Alternatively, the best way to discover all of the breathtaking places in Vietnam is to buy your own moped and drive through the country! We hired a moped in every spot we stopped at and it was so much fun. Unfortunately, we were unable to buy one as there wouldn't have been enough room for both us and our bags. There’s plenty of room for one person and a bag, but Cazzy isn't confident enough to drive a moped. However, I fully intend on heading back to Vietnam one day and completing this epic road trip myself! You would have so much flexibility and freedom in your route and stopping off in places that you would otherwise be unable to see on the typical Vietnam backpacking routes. 36. Drink beer for less than 50 cents! Easily one of the top ten things to do in Vietnam is to see how cheap you can find local beer! Don’t worry, it’s really not that bad and you can get glasses of beer for even less than 50 cents in many places. Hoi An proved to be a great spot for finding cheap, great tasting beer and we even saw a group of local students pre-drinking in the place we were having dinner! This is another one of the few things to see in Vietnam that we were unable to do on our trip. I've heard a lot about the Mekong Delta, which is a large maze of swamps and rivers that exist in the south of the country below Ho Chi Minh City, and I can't wait to visit. Taking a Mekong Delta tour is a crucial part of my next Vietnam itinerary. Here, you get the chance to hire out a boat and sail through the never-ending maze of passages and waterways. People live on the Mekong Delta their whole lives and have floating houses, schools and shops and rely on local fisherman to feed the families. 38. Stay at hotels you couldn’t afford anywhere else! One of my favourite things to do in Vietnam is to take advantage of how incredibly cheap the country is and to stay in decent accommodation for once! For less than 10 dollars per person, you’ll find modern, clean and spacious rooms that you will find hard to get in other countries. As a standard, we only started staying at hotels with a minimum of 8.5 reviews of Booking.com, as well as a swimming pool! If you don't travel on a budget, then this point might not impress you as much, but for us, the freedom of being able to travel in style and forgo cheap hotels and hostels for a few weeks was awesome! As you might imagine, the breathtaking countryside of Vietnam makes for ample hiking opportunities. Many of the nicest trails can be found in and around the more mountainous areas like Dalat and Sapa. Generally speaking, these regions are also far cooler than others as they are higher in the mountains and away from the incredible heat of coastal cities. We didn't do too much hiking ourselves, so I recommend checking out this article here for some of the most popular hiking trails found throughout the country. Vietnam is a photographer’s paradise, and is indeed one of the most spectacularly beautiful countries we have been to so far. When I think of Vietnam, I think of lush green forests of palm and rolling mountains. There are also some of the most spectacular beaches you’ll find anywhere in Asia, with golden sandy shores and crystal blue water. So make the most of your Vietnam trip by taking with you a decent camera and get ready to pose for some truly Instagram-worthy shots. My favourite spot for taking photos was probably Halong Bay, largely because we were very lucky with the weather and had calm water and clear blue skies the whole time we were there. One of the things you must do whilst in Vietnam is to take a cooking class. Cazzy and I were both big fans of Vietnamese food, largely because it wasn't very spicy; especially compared to how spicy everything is in nearby countries like India. Perhaps my favorite was Vietnamese curries which don't rely on heavy amounts of coconut, but instead are a much nicer blend of herbs and spices. Vietnamese spring rolls are also a simple favourite and we learnt how to make these whilst on our Halong bay cruise tour. You'll find cooking classes being offered in almost every major town or city in Vietnam. But to get the most out of the experience, opt for one that first takes you round a local market in order to pick up all of the fresh produce before you get to work. Aside from suits, which I talk more about below, no trip to Vietnam would be complete without picking yourself up a few knock-off pieces of clothing. You’ll find clothes markets dotted all across Vietnam and almost all major cities seem to have a good few stalls selling their wares. We chose the markets in Hoi An as a great place to pick up some new bits and Cazzy bought herself a couple pairs of shoes. Though they are clearly knock-offs of the real brands, they are made to a very high standard and will last just as long as the real thing. Many of the largest global clothing and footwear manufacturers operate in Vietnam, so there’s a good chance that what you’re buying might even be a defect product that simply didn’t meet the strict quality guidelines of the retailer. One of the best things to see and do in Vietnam is to witness the spectacular sunrises and sunsets. If you’re high in the mountains, in somewhere like Dalat, then you will find that it is typically much more cloudy and overcast so you don't get to appreciate these as often. However, if you're making your way along the coast, then you'll see plenty of gorgeous sunrises and sunsets on your tour of the country. My favourite were those that occurred over rice paddies and fields whilst we were driving back on our moped for the day. Halong Bay is also well famed for its sunsets, and you can make full use of these from a sun lounger on board your chosen cruise. Just like Thailand, there are massage parlours located all across Vietnam, and they are far more affordable than you will find elsewhere in the world. We opted for a typical Thai massage when in Bangkok, and I found the whole experience to be tantamount to abuse! What with the Thai ladies walking all over you and bending you this way and that! By contrast, old-fashioned Vietnamese massages are based more around massaging out knots, as opposed to contorting your body into different shapes. Prices start from as low as 3 dollars and you can get a simple foot massage for even less. As such, they are one of the cheapest things to do in Vietnam and a shoulder or foot massage is a great way to relax after a day spent riding around on a scooter. As I've already mentioned, one of the best things to do in Vietnam is to hire a moped and drive yourself about. Well, as a part of this, it’s worth getting yourself lost from time to time by following the winding roads in amidst beautiful green fields and rice paddies. One area I’m particularly annoyed we didn’t get to see whilst in Vietnam was Sapa. It is located in the very far Northwest of the country, close to the border with China. It is famed for its terraced rice fields and seems to be one of the most beautiful and unspoilt areas in the country. In the coming years, Cazzy and I fully intend on heading back to Hanoi, just to hire a moped and take a 1 or 2 week journey all around the very north of Vietnam; taking time to appreciate the rice paddies and landscape of areas like Sapa. Vietnam truly is a spectacularly beautiful country, and it is known for having a hot, peaceful climate, as long as you avoid monsoons that do crop up at certain times of the year. As such, no Vietnam trip would be complete without taking time to relax and unwind in the sun. I recommend taking a few days to chill on one of the many beautiful Vietnam beaches located all up the country. For me, I found Nha Trang to be particularly nice as the whole city is catered towards holiday goers from Russia. You’ll find long strips of beach here, all offering beach chairs and umbrellas with views out over the crystal blue water. Another one of the more famous things to do in Vietnam is to get yourself a suit made. Compared to the prices you’ll pay back home in countries such as the UK, handmade suits in Vietnam are incredibly affordable. They are also a very good quality and the craftsmanship is sublime. They typically require around 24 hours to make the suit, so you need to go to the store on the day before in order for them to take all of the measurements and for you to decide on the exact style and materials. I can't recommend an exact store, because there are literally hundreds and hundreds of them in the major cities. However, Hoi An is particularly well known for the local tailors, so this could be a good place to start. Just ask your hotel or hostel owner to take you to a good store and they will be able to hook you up. But I do recommend that you first check around before deciding on a tailor, in order to get the best deal. As well as offering an assortment of high octane water sports, Vietnam is also a popular destination for scuba diving. Compared to other countries, it is quite affordable to learn how to scuba dive in Vietnam and to get your qualifications. Some of the best Vietnam tourist destinations for scuba diving include Nha Trang, Phu Quoc Island, Vinh Hy Bay and Hoi An. It’s probably worthwhile doing your research online before you arrive in order to find somewhere offering the best scuba diving opportunities at your chosen time of year. Whether we were getting some work done on our laptops or unwinding after a busy day spent exploring, one of our favorite things to do was to find the local Highland Coffee. We’re both pretty big fans of coffee, Cazzy in particular, so it’s always nice finding a decent chain. We’re not big fans of all local Vietnamese coffee, however Highlands Coffee was superb and there outlets are always air-conditioned, clean and have great WiFi! It’s kind of like a more affordable version of Starbucks and we even brought home some of their coffee seeing as how great and well priced it was. There are so many things to see in Vietnam, that taking a train ride is actually a great way to help you discover more of the countryside. With just a few weeks in the country, it’s certainly not possible to travel everywhere, but I would recommend taking the train, as opposed to flying, as it means you miss out on far less. Of course, it’s not worth taking the train for smaller journeys, but it comes in particularly useful for the large stretch between Hanoi and Phong Nha (the nearest station being Dong Hoi). They offer different qualities of cabins, as well as sleeper births if you fancied taking a longer overnight ride. Whenever you decide to get a train anywhere you’ve not been before, I recommend using Seat 61. This site offers incredibly in-depth guides on train journeys for almost every country, and their guide on Vietnam will help you learn everything you need to know. Planning a Vietnam itinerary is actually pretty challenging, seeing as the country is quite large vertically and there are so many popular places scattered throughout it. As such, you need to take some time to decide which of the things discussed above you wish to do whilst in Vietnam, and also decide how long you have to spend here. 3 weeks is a pretty standard length of time to spend in the country, and is the total amount of time we spent here as well. It gives you chance to travel from Ho Chi Minh in the South to Hanoi in the North, and cover most of the best Vietnam points of interest along the way. So below is a list of the places that we visited in Vietnam and which I recommend you visit as well. By going to all of these places, you’ll also be able to do all of the 50 things discussed above! How do you get around Vietnam? Getting around Vietnam is both cheap and easy to do, which is another reason why I love this country so much! This is what we did and is what I recommend you do if you are travelling on a budget. It costs a little over 30 dollars for a pass that allows you to travel to every single one of the destinations listed above, except for Halong Bay (transfers to halong Bay are usually included in tour packages from Hanoi). You can pick this pass up in all major cities, and we bought ours in Ho Chi Minh. We saw tonnes of tour companies advertising these tickets and they are all a fixed price, depending on which selection of stops you opt for. Also, what’s great is you aren’t limited to travelling each route on certain dates. Instead, you simply call up a day or two before you want to leave for your next location and you get booked onto the next bus. Finally, all buses are extremely comfortable, with all of the longer journeys being sleeper beds! I actually recommend taking a train as one of the best things to do and see in Vietnam. There is a fairly extensive train network that travels throughout the entire country and which takes you to most major towns and cities. For more detail on how to book tickets and check times, I recommend using this article here. If you are only visiting a few spots in Vietnam, then it is possible to catch an internal flight and save a lot of time spent travelling by road. We didn't take any internal flights whilst there, but did meet a few people doing so. When booking any flights, we recommend using Skyscanner to find the best value deals. When travelling between destinations, you can book private transfers if you wish. Again, we never did this but imagine it can be quite a bit quicker for some journeys than taking a bus. 5. Buy a moped and drive yourself! If you're a fan of Top Gear, then you’ll have seen the Vietnamese special which saw the trio each buying a moped and driving it the whole way through the country. This is something I have long wanted to do and very much intend on doing some day. Whenever we were in a new location, we always used a moped to get around all of the sites as it’s incredibly great fun, cheap and convenient. We met some people in Thailand who did exactly this and went and bought a moped each before driving them all the way through the country. As you'd imagine, this isn't for the faint hearted as doing so comes with risks. One of the guys mentioned actually fell off at one point and broke his collarbone (*OUCH*). If you do wish to do this, then do be warned that drivers in Vietnam aren't particularly good and never drive late at night as many vehicles drive on the wrong side of the road and lack suitable headlights! For a better idea of what to expect, go ahead and watch the Top Gear Vietnam Special! What is the best time of year to visit Vietnam? Typically, the most popular times to visit Vietnam includes August to October and February to April. In these times, there is supposed to be less chance of heavy rainfall and the heat isn't as intense. At the same time, the climates across Vietnam do vary and the best time to visit may vary depending on exactly where you want to go in Vietnam. Luck also has a large part to play! We visited in September and went from south to north without encountering any bad weather along the way. But to be fair, the day before we arrived in Hoi An, they experienced a massive typhoon that struck the entire northern region, destroying thousands of homes and killing a few dozen people. It also led to terrible weather in Halong Bay and all cruises were cancelled for about a week prior to our arrival. However, none of this bad weather affected us and we missed it all, so i suppose a lot of it does come down to luck as you can never fully know what’s going to happen! But based on personal preference, I do advise not visiting in the peak summer months from June to August. During this time, temperatures in the coastal locations gets incredibly hot, and Da Lat is one of the few areas where you're not battered by heat all day. But again, this is all comes down to how much you like the heat. For more information about Vietnam’s climate, here's a good site to use. How long do you need to see all of these things to do in Vietnam? We spent 3 weeks in Vietnam and that was plenty of time to see and do all of the things discussed above. This meant spending 2 nights in most spots and doing a lot of sightseeing every single day; so you’d really be pressed for time if you wanted to get in and out in just a couple of weeks. If you do have less than 3 weeks there, then I advise splitting up the country into two parts and maybe doing a trip around the northern locations this time around and maybe coming back in the future to spend two weeks in the southern parts. 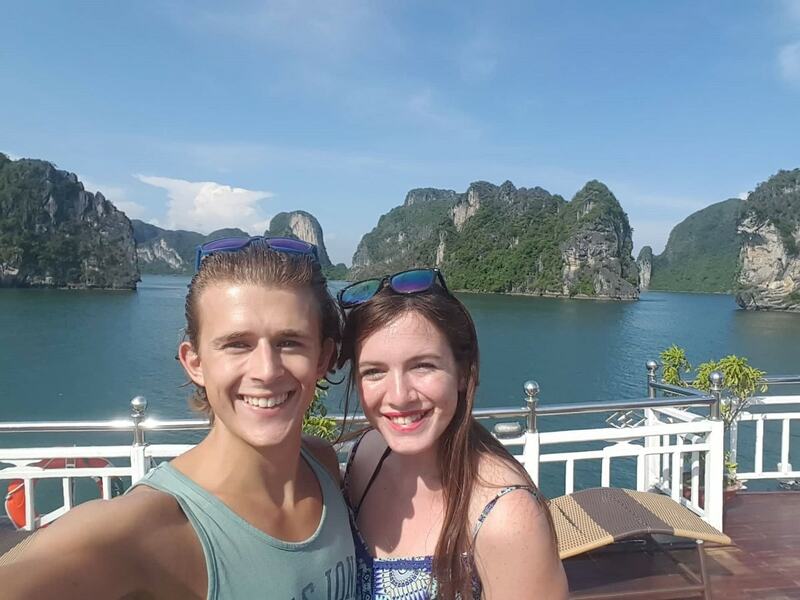 Vietnam is incredibly cheap and we lived like Kings and Queens there and only spent around $20-$25 a day. The most expensive thing we had to pay for in Vietnam was our Halong Bay Cruise. Other than that, most sites are very cheap and so is all of your food, transport and accommodation. Is Vietnam a safe country to visit? Generally speaking, yes Vietnam seemed to us to be a very safe and friendly country to visit. The most dangerous aspect of our visit was perhaps the traffic, as many rivers there are very bad, so you need to keep your wits about you when driving a moped. Also, be sure to follow the sorts of common safety principles you'd follow in any country. Like never going out on your own after dark and keeping your valuables safely tucked away and out of sight in busy crowds. Well, there you have it! All 50 of my favourite things to do in Vietnam. I hope this Vietnam travel guide has helped you in at least some way to come up with ideas of things to see and places to explore. The 4 weeks we spent in Vietnam was amongst some of the best experiences of my life and i can't wait to return one day and uncover even more stunning sites in Vietnam and would particularly like to check out some more off-the-beaten path locations. So if you have any more tips on places to visit in Vietnam, then please do comment below and let me know. And if you have any questions or need any more advice then just ask away and I’ll try to help wherever possible!